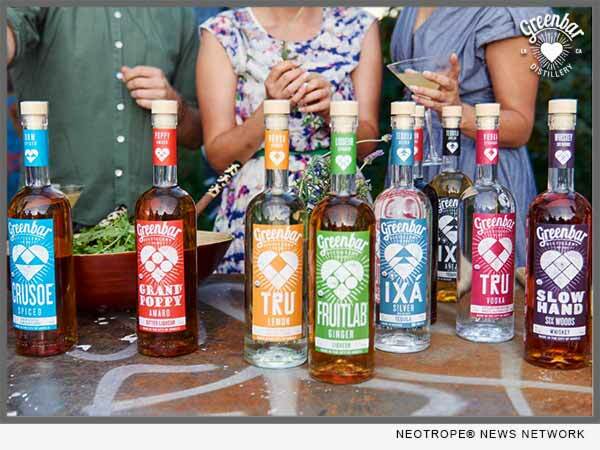 LOS ANGELES, Calif. /California Newswire/ — Greenbar Distillery, one of California’s original craft distilleries and home of the world’s largest portfolio of handcrafted, organic spirits, today announced that it has unified its seven core spirits lines under a new heart brand that evokes the company’s origins as a love story between the two founders, Litty Mathew and Melkon Khosrovian. In sharp contrast to how most distilleries design their packages to stand out within categories, such as vodka or whiskey, Greenbar Distillery’s new look echoes the maker-focused branding of craft brewers. The distillery, based in the Arts District of downtown Los Angeles (http://www.artsdistrictla.org/), designed its new labels in-house to reflect the founders love for each other, their fans, their city and its immigrant food culture, as well as California’s rich agricultural bounty. With its high-design heart imagery, hand-drawn font and distressed look, the new branding reinforces the distillery’s emphasis on relaxed sophistication. Further connecting Greenbar Distillery to its home city’s cultural terroir, the logo harkens the Mexican Sagrado CorazÃ³n (sacred heart) iconography found throughout downtown Los Angeles, while capturing the gritty appeal of the graffiti art that defines DTLA’s cityscape. The rays symbolize Southern California’s ubiquitous sunshine, critical to the state’s inimitable flora that’s captured within each bottle. The individual labels play on the heart theme while serving as symbolic guides to what’s inside, playfully alluding to the ‘spirit’ of each spirit. IXA tequila’s label recalls the mountains of Jalisco, CITY Gin’s layout resembles skyscrapers, TRU Vodka reflects diamond purity and so on. Greenbar Distillery’s move to consolidate its labels under one clearly defined house aesthetic marks a departure from the traditional distillery trajectory of dissociating certain sub-brands. The company’s use of only real, organic ingredients, commitment to sustainability (http://greenbardistillery.com/sustainability/), and the resulting quality-to-value prices resonate with the public. Melkon and Litty are thrilled to launch the new packaging to help make Greenbar Distillery products that much easier for the home mixologist to identify and enjoy. Greenbar Distillery, Los Angeles’ first since Prohibition, makes the world’s largest portfolio of craft organic spirits, including TRU vodkas, CITY gin, CRUSOE rums, FRUITLAB liqueurs, IXA tequila, SLOW HAND whiskey, GRAND POPPY amaro and BAR KEEP aromatic bitters. Founded in 2004 by the husband-and-wife team Melkon Khosrovian and Litty Mathew, the company seeks to make better spirits for a better planet.